Not happened before so I thought something not's right. Loosened it all off and checked the motor pulley, then the main shaft and finally the countershaft. I was surprised the amount it took to turn, not seized or remotely like but not as free as I expected. That got me thinking, I don't know how free running it should be. I certainly can't flick it and then wait for it to run down, and with the clutch mechanism inside maybe it is stiff. I also pulled the clutch drum off and did a visual inspection of the outer bearing, it seemed fine. Pulled the oilers out and inspected for bronze fragments, nothing. Anyone else give their countershaft a hand turn and see how it feels. Other than getting the luggage scales on it to see how much it takes to move the pulley I am stumped. The bearing journals are not getting hot either. Om my S7 with the clutch disengaged and the headstock drive belt off the pulleys, the countershaft will turn by hand but will not spin. 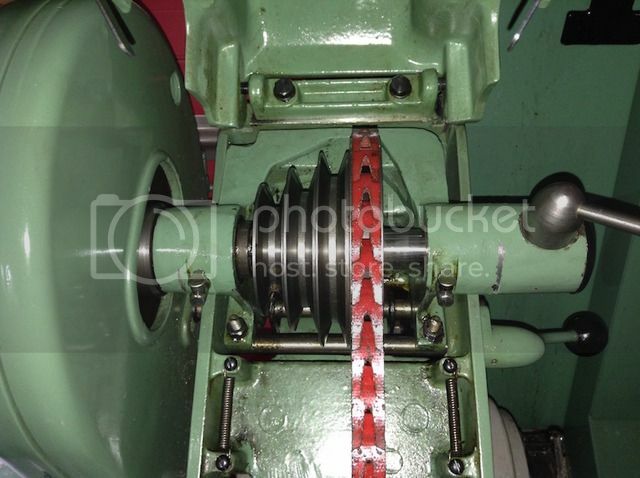 Engaging the clutch, to add the weight of the clutch assembly and the motor to the revolving mass, and pulling sharply on the motor drive belt has the countershaft assembly running for about half a turn. So not free running at all, but not stiff. Thanks John, that sounds about right. Maybe it was just that alloy cheese from the 4th dimension I was machining. Motor run capacitor gone low capacitance ? Thanks Andrew, I have a VFD on this one... I think it was just me thinking this didn't feel right.